Recently spent a day touring the north shore of Lake Erie from Port Stanley to Long Point to Port Dover. The day was overcast but the clouds were thin enough to diffuse the light. This produced studio-like lighting for most of the afternoon. Long Point is that long sand spit that can be seen on maps and satellite views of Lake Erie. A seriously important wetland, it has been designated a World Biosphere Reserve by UNESCO. According to the Long Point World Biosphere Reserve, it is one of the most important wetland complexes for migrating waterfowl in southern Canada. In addition to its relevance from a biological point of view, Long Point is a popular vacation destination with beaches, boating, vacation homes and camping. Long Point Provincial Park inhabits the eastern end of the point. During the off-season, most of the shops and restaurants are closed but the scenery remains spectacular. 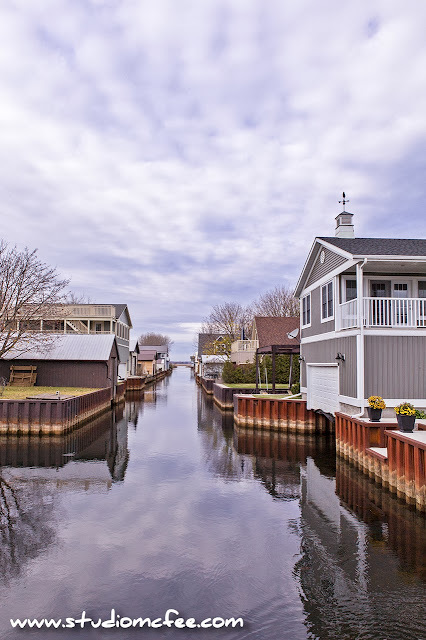 The canal (in the photo) leads to the bay and gives you some idea of the charm of Long Point. A future post will feature photos of the wetlands. Stay tuned.